Student loan just come in? Had a pay rise recently? Fancy a treat? 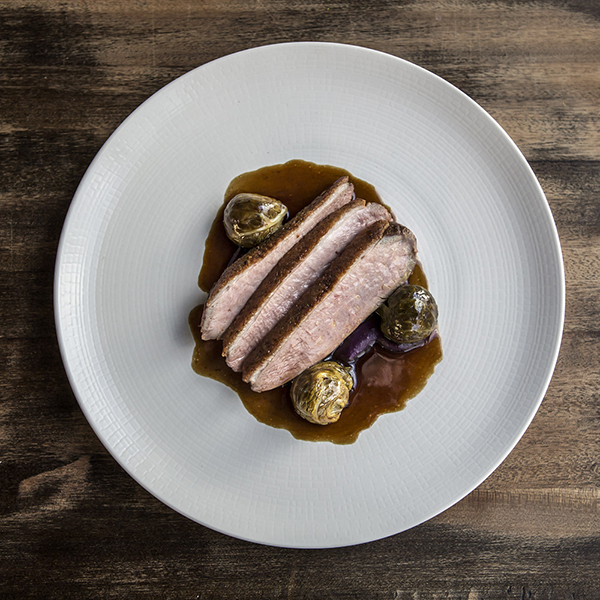 Adelina Yard is a classy entry into the world of Fine Dining. This Michelin Guide restaurant in City Centre really knows how to make high class, professional food. It is a cut above your favourite Friday night place to eat out. I would reserve it for the specials; 21st celebrations with your parents, graduations, you know the type. Down by the Apple Bar and King’s Street, tucked away in a random alley that does not do it justice, the hidden quality of Adelina Yard was a pleasure to experience. Whilst close in proximity to the Apple, it couldn’t be further away. 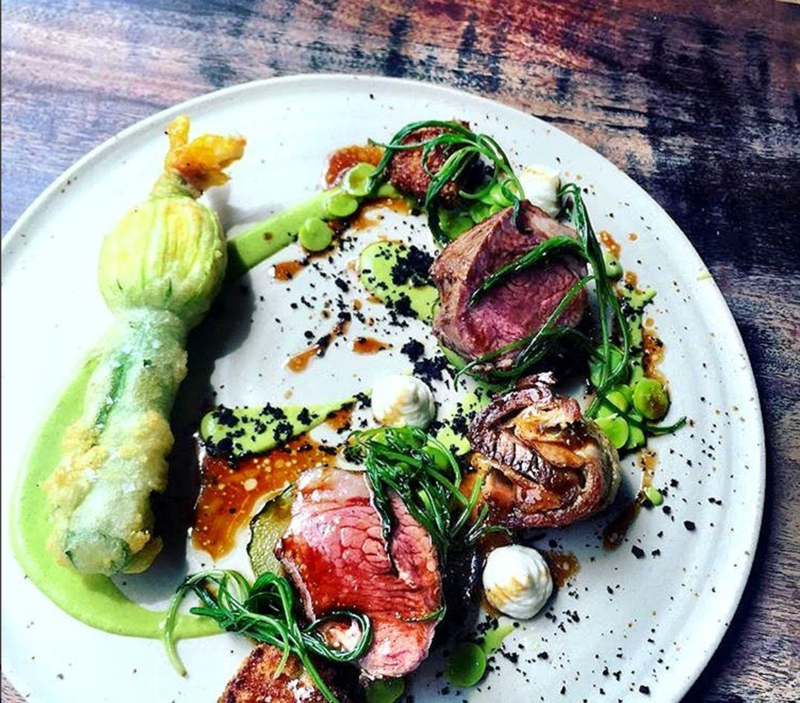 Think more dining out before watching the theatre in Bristol Old Vic because this restaurant will put on just as much of a show. With clean, simple décor and a beautiful terrace backing onto the river, we stepped into a pocket of refinement betraying its dockyards outside. The maître d’ welcomed us in with warmth and politeness, offering to take our coats and leading us to our table past the open plan kitchen. It gave the feeling of being honest with an open kitchen for spectators to watch the chefs working their craft. It made us feel comfortable. Fine dining can often be an exclusive, unwelcoming club to the uninitiated but Adelina Yard had none of that. Price tags on the artwork were the only slight irritation- you’re already bleeding my bank account dry and I’m not here to window shop. I’m a petty person. It was a minor niggle, but when you’re playing in the big league these things count. Why then a raving review? The food is sophisticated and delicious. Often when eating out at good restaurants I enjoy the food, then go home to try and recreate parts of it. Not here. This is a skill level and complexity level beyond any home cooked food. These guys are professionals plying their trade. As the maître d’ came to take our drink orders he brought over fresh baked bread, home churned butter and a plate of canapés to whet our palates while we chose our starters and mains. The menu changes with the season and is both intriguing and imaginative. The starters were led by the most succulent slices of raw beef with bone marrow and burnt apple, but even this was out shadowed by the seared cod cheek, shimeji mushrooms and crispy squid tentacles served with a broth reduction to pour over. That got the tastes buds excited, but the mains were simply in a different league. The focus was all on the quality of the cookery; simplistically executed with nowhere to hide. And By God did it deliver in the two dishes we order. We ate the most perfectly cooked and rested duck breast- slightly pink meat that melted on the tongue, cut through by a salty crispy skin. This was accompanied by a meaty, well-balanced jus and burnt cabbage (not a mistake, roasted cabbage finished under a grill that has been very ‘on trend’ recently…). This dish was really made by little bonbons of bacon jam, delicately wrapped in cabbage leaves. Adelina Yard has an inspired knack to take ingredients you know and love and form them into flavours far beyond any expectation. Each mouthful is simply a pleasure to experience, and the second dish was no different to this with a take on surf-and-turf. We ate brill, as light as could be, that flaked apart as your fork touched it. The second element of this dish was confit chicken wings. Equally well executed, they were tender and flavoursome without being greasy, the danger confit foods runs. These were supported by charred spring onions that were a little less delicately presented than the rest of the meal, and perhaps could have done with another variety of veg on the plate. The maître d' informed and advised us well on suitable wines to choose for our menu, and got it spot on. Both wines acted as another part of the dish, accompanying the meal beautifully. At this point pudding had a lot to live up to, but was certainly no let down. A deconstructed poached plum cheesecake, made interesting with a creamy goats curd and granola replacing a more traditional approach, with a smooth plum ice cream. Our second choice, although it was a hard task picking from this menu, was poached slices of quince, coffee and praline quenelles of ice cream, with pieces of spiced cake. They were a perfect pair to conclude our foray into fine dinning; a long held pudding phobia put firmly to bed. 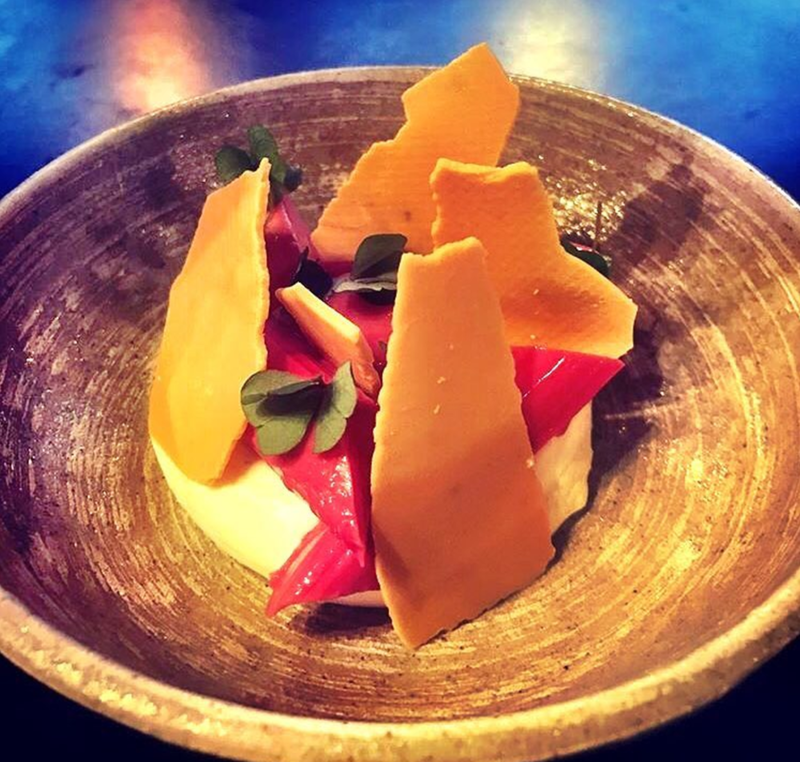 Adelina Yard’s finessed flavours give it a strong claim to be the very finest food that Bristol’s Fine Dining scene has to offer. A ‘Must’ on the tick list of the foodies out there, but you probably won't find it on Deliveroo.